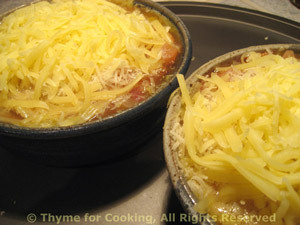 Soup A L'Oignon, (French Onion Soup) French wedding tradition, Thyme for Cooking. This recipe does not use any stock, but rather white wine with beef base. This is different than regular old 'bouillon cubes. You'll find it in jars in the soup section, normally and it's usually a paste. I always have both chicken and beef on hand to use for stock. This makes just 4 servings, very thick with onions... as it should be. Heat butter and oil in large soup pot or Dutch oven over medium heat. Add onions and sauté until golden brown, 20 - 30 minutes, stirring occasionally. Add flour and sauté briefly, stirring - about 1 minute. Slowly add the water, stirring constantly until thickened. Slowly add the wine, stirring constantly to avoid lumps. Add the beef base, stir well, cover and simmer for 30 minutes. Shred and grate cheeses if necessary. Slice bread 1" (2.5 cm) thick. Trim to fit in oven proof soup bowls. When hot, put bread on tray and toast 1 side under broiler, about 1 minute. Ladle about 1/4th of the onions into each of 2 bowls. Place bread on top, toasted side down. Ladle broth over the bread to fill bowl - leaving room for the cheese. Top with both cheeses. 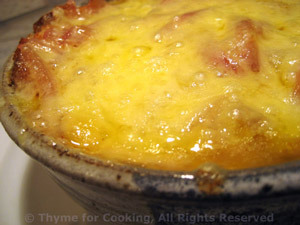 Put bowls on a tray and slide under broiler until cheese is melted and bubbly. Serve. Note: Put the bowls on a baking sheet for easier handling.